The moment you free that huge coffee table book from its packings, you feel that is indeed something special. This is of course because of its size (21 x 3,5 x 28,9 cm) but it is also because of its content. As I wrote before when I had the first volume in my hands, “Letters of Note, Volume II” again makes letters available for readers and lure them into a very special place. The place – maybe the living room – is a very private one, normally not open for strangers, a place where letters were written in a time when the internet wasn’t even thought of. So this book is a treat to dive into, to flick through its pages and get hooked by facsimiles, pictures or the name of the writer or their receivers. You want to have it within reach to hold it and re read certain letters again, so do make room on your shelves. And you’ll get letters by Abraham Lincoln, Aldous Huxley, Janis Joplin, Charlotte Brontë, Michelangelo, Alan Turing, Wolfgang Amadeus Mozart, Florence Nightingale and many more. They tell stories of their writers, give little insight looks into their lives at a special moment in time and will never leave you untouched. You will find different editions but even if you love reading ebooks (as I do), do yourself a favour and go for a hardcopy. It’s worth the money. Unbound is a way of crowdfunding books directly by supporting their authors. Depending on how much money you want to spend, you get goodies and of course the books you are supporting. After signing up for Unbound – which is for free – and you have made up your mind to support a book you want to get to life, you’re getting emails keeping you updated on the progress the book is making. 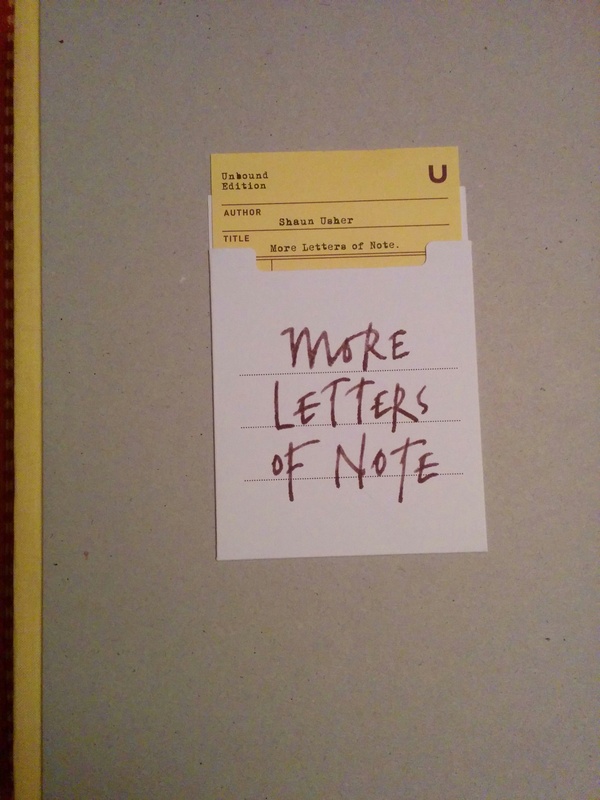 Shaun Usher, Letters of Note II, Unbound. [Note: I was one of the subscribers and am very happy that this book wouldn’t exist without me, as Shaun Usher wrote. I¦ve been exploring for a bit for any high-quality articles or blog posts on this kind of area . Exploring in Yahoo I finally stumbled upon this website. Reading this info So i¦m satisfied to exhibit that I have an incredibly excellent uncanny feeling I found out just what I needed. I most without a doubt will make sure to don¦t disregard this site and give it a look regularly.